Goran found tarot on YouTube and fell in love! Goran fell in love with the Rider-Waite tarot deck after watching a YouTube video. Now, he's reading cards professionally. You can read his story here! Hi Goran! Thank you for taking time to answer our interview questions today! I've enjoyed getting to know more about you and your background! Psychic World: What's your name and how you describe what you do? 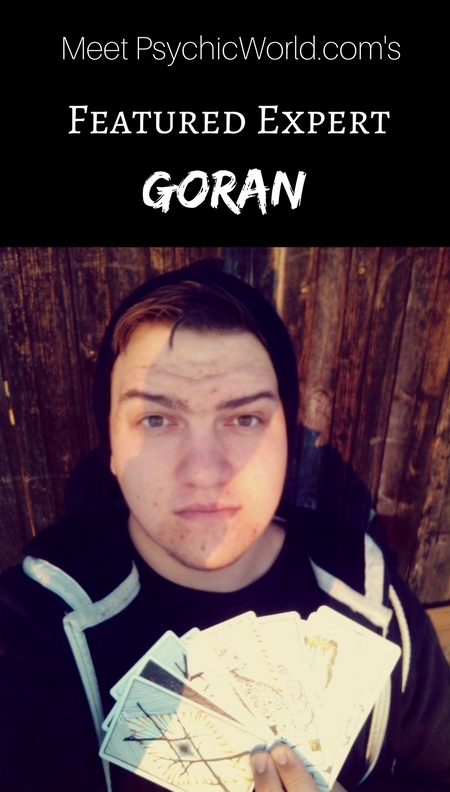 Goran: My name is Goran, I like to say I'm a facilitator for knowledge, energy and thought that needs to come through for myself or people I read for. Also, I consider myself to be a storyteller: storyteller of past, present, and future. I like to create a safe and high-vibe space for my readings where everything can be shared and worked through. Psychic World: Do you have a story about how you got started? How long have you been working with your gifts? Goran: My spiritul/witchy story began a long time ago, I was always into witchy stuff and that I believe lead me to my tarot story. My story began by watching a YouTube video. I came across a video that was a review of a deck, a deck I got few years later and fell in love with. I was intrigued by this 'thing' I only ever saw on TV. And at that point, I knew there were alot of fake readers on the internet, so I was very skeptic towards the medium of tarot. I continued watching more and more videos on tarot and by the end of that summer I had my first deck and so my story continued and is still going. It's been a fun couple of years - to be more exact, four and a half years. Psychic World: What are your favorite tools/decks/methods of reading? Goran: My most beloved tool is, of course, tarot and oracle cards. My first, most used and beloved deck is Rider-Waite. I like to use oracle cards in my readings as well. I will pull a card to clarify a message, or at and end of a reading as a guiding message. I also use a pendulum. I love the direct and focused answers it gives. My pendulum will mostly come out in a reading where I need a yes or a no answer. From time to time I use my runes as well; I find them very interesting to use. With them comes a long standing history and wisdom, which in my opinion brings more depth to a reading. Psychic World: Are there any areas you adore working in? (love, career, empowerment)? Or any people you feel that you connect with best (single women who are healing from a past relationship/those who are looking for spiritual advancement)? Goran: I enjoy every reading I do. I love working in self-empowerment, and other kinds of deeply personal topics, because you will get the most out of that kind of a reading. Every reading is powerful but a reading like that especially powerful. I love doing readings where you are willing to go deep inside the question and yourself. To see what lies beneath the surface, that's just gold right there! Psychic World: Any stories about working with a client that you'd like to share or any paranormal/enlightening/near death experiences you feel were significant to your work? Goran: The one reading I always like to recal is the one I gave to my friend. Nobody knew I was working with tarot, besides my parents for the first year. The first person I told after that was my friend, and she was excited for me, which I thought was so amazing of her. She was the one I gave my first proper reading to. I was so amazed at myself, cause at that point, I would always have a book beside me when I would do readings, cause I still didn't have all the meanings in my head. But this time it was different. I had to do it on my own. I had to channel the images and just say what I thought they meant. And wouldn't you know, I did well! That day I was hapbecauseuse of two things: Firstly I could finally do a reading on my own and secondly, I had someone I could share my weird side with. Psychic World: Anything else you'd like to add? Goran: I love what I do, and I would love to share that love with you. If you choose to come and work with me, know you are entering a space where you can be compleatly open and free. I have embraced my weird side for what it is, and all it can give and share with the world. I hope you find whatever answers you are looking for, with me, and take with you a peace of self you never knew existed. If you'd like to get a tarot reading from Goran, just click on his name! He'll be online from about 2 pm - 12 pm CET (8 am - 6 pm EST) this week.